The Lawn Tennis Association (LTA) has confirmed that former world No.1 Victoria Azarenka and American star Madison Keys will play at the Aegon Open Nottingham WTA event in June. Both players will be making their debut at Nottingham Tennis Centre as part of their preparations for The Championships, Wimbledon. Azarenka is a two-time Grand Slam champion Azarenka while 21 year old American, Keys is looking to add to her 2014 Aegon International Eastbourne title. 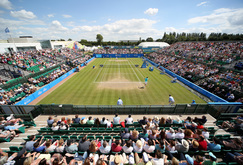 Nottingham Tennis Centre is the perfect setting to enjoy a fantastic summer’s day of spell-binding sport. *Calls cost 7p per minute from a BT landline. Other networks may vary and calls from mobiles may be considerably more. Lines are open 7 days a week 8am until 10pm. For those wanting an extra special day out at the tennis, hospitality at the Aegon Open Nottingham provides the ultimate package. Hospitality includes premium Centre Court tickets, champagne and canape reception, a spectacular three-course lunch, afternoon tea and inclusive bar service. Prices start at £99 +VAT per person.